This ready-to-use workshop provides helpful tips and offers suggestions to service providers for discussing smoke-free homes. It provides information about sacred use of traditional tobacco and about the negative effects of recreational use and misuse of commercial tobacco. a facilitator guide, downloadable as a PDF for free. It includes an evaluation form that service providers can give to participants. 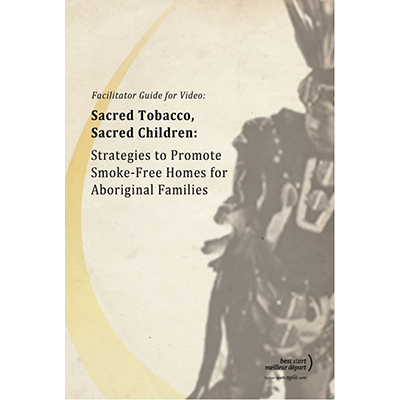 the video Sacred Tobacco, Sacred Children – Strategies to promote Smoke-free Homes for Aboriginal Families. Watch it for free on Youtube, or download it for 50 CAD.